In APAC, programmatic is still in its early stage in several emerging markets, but more mature markets are beginning to compete with the US market adoption rates. It is critical to have a different analysis for the APAC market based on the diversity of the region. The findings could vary within the region which requires enhanced research in order to have a better understanding. While Australia and New Zealand are the most advanced markets in the region with an average of 50% programmatic rate, as well as the highest adoption of PMPs, the rate is very low for other countries such as Thailand and Indonesia. Furthermore, the region still has publishers from traditional media background who are still not ready for programmatic. To better understand the state of programmatic advertising in APAC, let’s dig deeper and explore the top programmatic trends in the region during 2017 and what is to expect in the future. APAC leads global ad spend growth globally and is to grow up to 33.4% of the global figure by the next year 2019, according to Zenith’s latest forecasts. According to Magna, digital Ad spend across APAC increased by 5.6% in 2017 to reach $156bn. 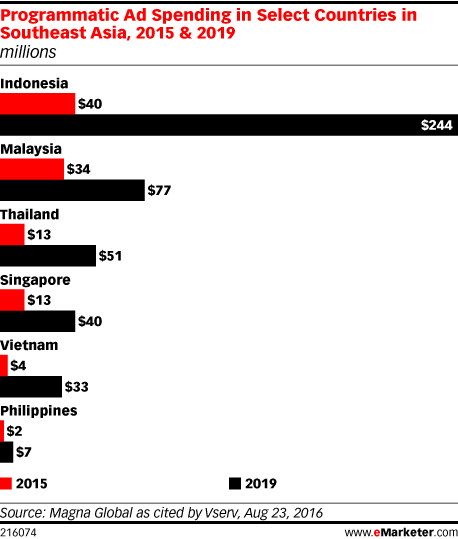 The huge increase in Ad spend is driving programmatic in APAC market to reach a new milestone. 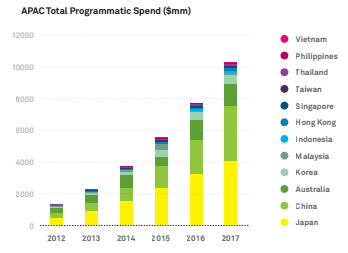 According to the forecast, programmatic spending reached $56 billion in 2017, surpassing the programmatic spend in North America. Moreover, the gap between APAC and US in respect to programmatic information is closing so we can expect to see APAC programmatic growth in line with US trends in the coming years. According to MAGNA, APAC region has the 2nd largest programmatic markets in the world, China as well as the 3rd biggest market, Japan. Furthermore, the region also presents some of the highest growth rates in global programmatic markets such as Australia, New Zealand, and Singapore. According to Ad agencies, 93% of marketers in Australia, New Zealand, and Singapore are investing in programmatic advertising with almost 32% of companies dedicate more than 50% of their digital advertising to programmatic. According to DoubleClick Ad Exchange, The top five countries in the world with the fastest-growing Programmatic Direct adoption rates are all in the APAC region: Indonesia, South Korea, Malaysia, Taiwan, and India. Would it be the turning point in the history of advertising? As the technology infrastructure is catching up with the global market and different AdTech platforms evolve locally to help marketers better understand the users, I am expecting APAC to become the center of programmatic evolution in 2018. 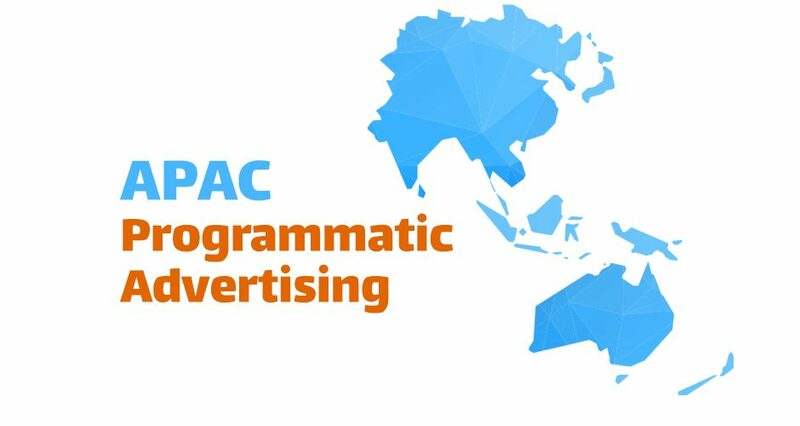 The diversity of consumer patterns, publishers and local networks across the region is the main factor that is impacting programmatic in APAC. The demand for programmatic as the most reliable solutions for digital advertisers to access the local markets with an effective strategy requires customized tactics. Google is still the easiest and most popular solution for a lot of the publishers in the region who tend to rely on DoubleClick for Publishers and Ad Exchange. Due to lack the ad tech people, skills or ad operations, so they find Google is an ideal solution. However, the situation is totally different when it comes to China. According to Eslam El Swedey, Digital Marketing Manager at Curvature Singapore “Baidu, Alibaba, Tencent, and iPinYou are playing the main role in China’s programmatic market. IPinYou will continue to grow in the coming year to become one of the top players”. This is not the only case, for instance, Japan’s 90% of the market belongs to Dentsu and Hakuhodo. Businesses understand that accessing the APAC market require a flexible approach and dealing with a variety of providers to get the best projected RTB solutions. Some people refer to Singapore as “Easy Asia” and I can’t agree more. Significantly, most of the international headquarters are settling at Singapore with their marketing and business development in APAC region. While the competition is expected to intensify with Hong Kong and Shanghai to access the China market, Singapore remains the best choice as a digital advertising hub. Among the most strategic reasons is to benefit from advertising giants such as Facebook and Google who might have several limitations in a city like Shanghai. Another main advantage of Singapore as advertising hub is money. As huge budgets that need to be paid for advertising, the secure financial system and stable exchange rates in Singapore provides an ideal situation for billions of dollars industry. 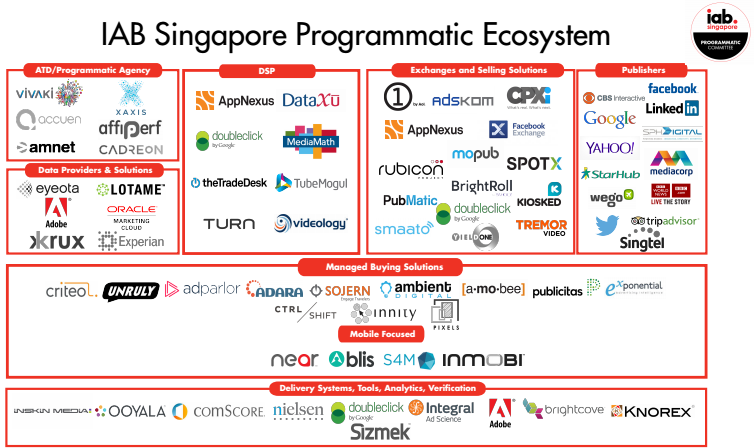 In the last few years, we have seen more and more advertising giants, DSPs, Publishers and AdTech agencies expanding rapidly in Singapore. Furthermore, Procter & Gamble, the world’s largest advertiser, are moving their regional power bases to Singapore. We expect to see a major increase in programmatic adoption and advertising technologies coming out of Singapore and targeting the whole APAC region. According to Google research study which was published at in July 2017, the majority of countries within the APAC still buy offline. The study examines how consumers in APAC research and buy products for financial services and baby care and the findings are not a big surprise especially for Singaporean marketers. Programmatic is still struggling with the providing a profitable alternative to advertisers. The challenge is bigger with markets like Indonesia, Vietnam, India, and Singapore which doesn’t have the full potential yet for online conversion. However, the researchers expect the programmatic to grown in SEA region driven by a potential increase in online shopping. Certainly, some industries in the APAC market are already fully relying on programmatic such as travel, other industries such as services are struggling with the programmatic conversion rates. Singapore as an example has a small geography which that contributes to why marketers still not investing in programmatic and prefer traditional mediums with a higher return on ad spend (ROAS). Mobile is driving the highest growth in impressions in APAC region, which is generating a high demand for programmatic. According to DoubleClick Ad Exchange, there was over 150% growth in Programmatic Direct mobile impressions in APAC, followed by EMEA at 120% growth. Mobile impressions grew more than 15X in 2016 at Indonesia and tripled in more than eight APAC countries: Australia, China, Hong Kong, India, Indonesia, Malaysia, South Korea, and Taiwan. The huge amount of mobile growth in APAC requires a more sophisticated targeting and RTB which allows companies to distinguish their potential consumer and increase the efficiency of their advertising bidding. Video emerged as the fastest-growing format in programmatic deals across platforms and throughout the APAC. Video has proved to be an efficient way to reach audiences and monetize the publishers premium inventory. According to the numbers from 2016, programmatic video impressions in APAC grew to 29X the impressions in comparison with the previous year. Programmatic video impressions grew 6.5X faster than the display in 2016, and India and Australia are leading the way with total programmatic video impressions served in the APAC region. The fastest adopters of programmatic video in the world are all in the APAC region: India, China, South Korea, Japan, and Taiwan. China is ramping up programmatic video impressions the fastest of all countries in the APAC region. According to the outcomes of the recent study by Adroll, retargeting and attribution are the key focuses of marketers in APAC in 2017. Adroll report shows the average APAC marketer is spending between 25% and 50% of their digital advertising budget on retargeting and 83% of marketers plan to increase their mobile retargeting budget in the next year. The study shows that the growing cost of development and user acquisition are not slowing down, which force marketers to prefer the engagement with existing users over acquiring new ones who may or may not perform well. Technically there is a gap in this area but the advertisers are facing the pressure of the demand for clearly measurable ROI. The rise of attribution models is driving APAC marketers to pay more and more attention to marketing analytics and cross-channel attribution. Based on Adroll’s study, 79% of marketers believe attribution is critical to advertising success and 99% of marketers track view-through conversions in this region. Over 30% of Australian marketing professionals said that they spend over half of their yearly budgets on campaign measurement. According to experts in the market, the AI would have a big impact on the programmatic in the region. “Last few years it was about programmatic but this year and continuous years, the market will tend to dive more into 3 categories, 1) AI automated optimization based on Life Time Value LTV. 2) The interactive ad types like Facebook full page ad and Instagram stories. 3) Personalization will play an effective role as personalized dynamic banners give seamless experience. This improving conversion rate.” said JK, a consultant and marketing strategist. To conclude, APAC has a strong programmatic growth potential but it has also a number of fatal limitations, such as lack of qualified talents, extremely diverse and fragmented local ad networks, issues with access to consumer data, and difficulty to scale RTB transactions. The region still requires a more solid understanding of the importance and benefits of programmatic advertising. The advantage of programmatic reach is currently critical for APAC marketers to increase conversion rates and decrease the number of resources required to cover this geographically large region. Targeting different locales with such diversity of languages, networks, and consumer behavior are pushing for further procedures in terms of buying audience on premium publishers or local networks and connect a simpler activation on both sides. This demand will keep pushing towards a higher rate of programmatic adoption and budget share coming from performance marketing teams in the region. Share your insights and thoughts on the topic and write down what do you think will be a key trend? What is the next big thing will shift this market?